Install Firefox on your Mac. Purchase and install StopTheMadness in the Mac App Store. Open StopTheMadness on your Mac. In the "Install Firefox Add-on" window, click the Install button. In Firefox, click where indicated to install the Firefox Add-on. When prompted by Firefox, click the Add button. 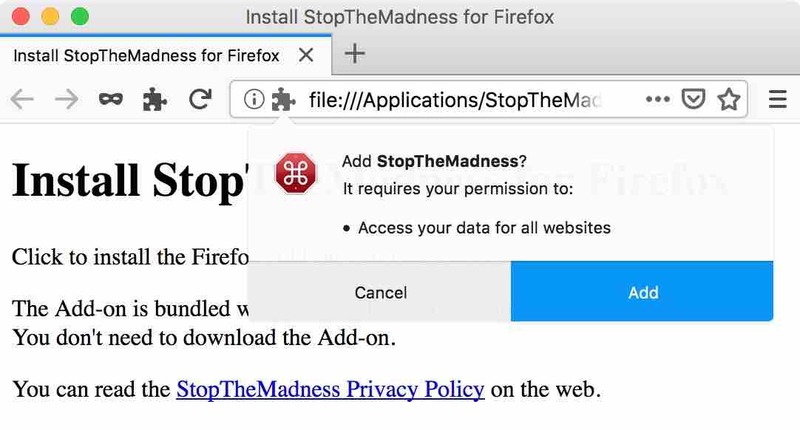 If you've already set up Firefox to sync with your Firefox account, then your StopTheMadness Website Protections will also be synced. This sync process is controlled by Firefox. The only data from StopTheMadness that would be synced is what you see in the StopTheMadness Options. The Firefox Add-on does not support automatic updates. It's bundled with the StopTheMadness app on your Mac rather than downloaded by Firefox. When the StopTheMadness Mac app is updated in the App Store, it may also contain an update for the Firefox Add-on. When you run the app, it will inform you when a Firefox Add-on update is available to be installed. At any time, you can install the latest Firefox Add-on version from the "Firefox" menu in the StopTheMadness app main menu. StopTheMadness is fully compatible with Firefox Developer Edition. 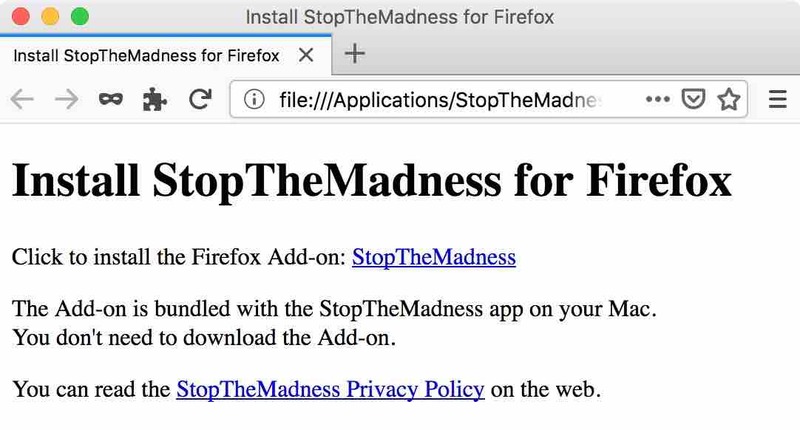 However, installing StopTheMadness in Firefox does not automatically install it in Firefox Developer Edition, so you'll need to use the "Install Firefox Developer Addition Add-on" menu item in the "Firefox" menu in the StopTheMadness app main menu. StopTheMadness does not inform you when updates are available to be installed for Firefox Developer Edition, only for Firefox, so you'll need to make sure that Firefox Developer Edition stays updated when there's a StopTheMadness update. By default, StopTheMadness stops web sites from disabling Firefox's contextual menu. If you still need to open a web site's custom contextual menu instead of Firefox's contextual menu, just press the option key while you open the menu. You can selectively enable and disable StopTheMadness protection features. Your custom protections can be configured to apply to every web page or just to web sites that you specify. 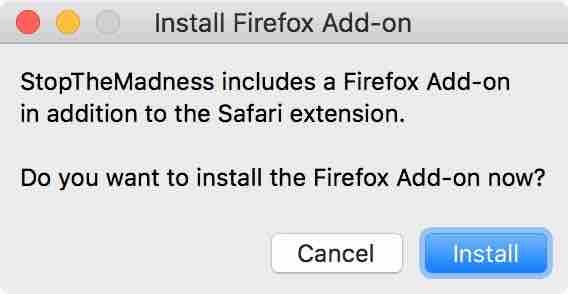 To change your protections, open the Add-ons window in Firefox, select "Extensions" to manage your extensions, and then click "Preferences" for StopTheMadness. There are a number of protection features that you can enable and disable. By default, most of these protections are enabled. (See the Contextual Menus section above to temporarily override contextual menus protection.) When a protection is enabled, it prevents websites from overriding Firefox's standard behavior. In most cases, you'll want the StopTheMadness protections to be enabled. However, sometimes disabling a StopTheMadness protection is necessary for website compatibility. If you uncheck "Cut, Copy, and Paste", for example, then websites are allowed to override Firefox's standard behavior for cut, copy, and paste. When you change the protections in StopTheMadness, those changes will apply the next time you load a web site in Firefox. If you already have a web site open in Firefox, and you want the changes to apply immediately to the web site, you need to reload the page in Firefox. The Default Website Protections apply to every web page in Firefox, unless you have custom protections for a particular site. To create custom protections for a website, enter the website in the New Website Protections field and press the Add button. There are two ways to specify websites: domain or URL. Examples of domains are "apple.com" and "google.com". If you specify a domain, then subdomains of that domain are automatically covered too. For example, "google.com" also covers "www.google.com", "mail.google.com", etc. If you want a subdomain to have different protections than its domain, create a separate item for the subdomain. The longest match always wins, so if you have items for both "google.com" and "mail.google.com", then your "mail.google.com" protections will apply when you load the page "https://mail.google.com/". If you want protections to apply only to subdomains but not to the domain, put a dot at the beginning: ".google.com" applies to "https://www.google.com/", etc., but not to "https://google.com/". You may want to apply custom protections only to certain paths of a website, in which case you need to specify the website as a full URL. For example, if you enter "https://www.google.com/maps", then the custom protections will only apply to Google Maps and not to Google Search at "https://www.google.com/". Subpaths are automatically covered too: "https://www.google.com/maps" would also cover "https://www.google.com/maps/search/apple+park". You can customize subpath protections by creating a separate item for the subpath. As with domains, the longest match among URLs always wins. And a URL setting that includes a domain will override a domain setting for the same domain, since the URL is longer. So "https://www.google.com/maps" takes precedence over "www.google.com". In these cases you may want to create custom website protections and disable the specific protection. docs.google.com : Cut, Copy and Paste. WordPress Gutenberg editor : Text Selection. Apple Mac Pro Product Page : Scrolljacking. phpstan.org : Cut, Copy and Paste. Text Selection. ⌘-Key Shortcuts. StopTheMadness is Copyright © 2018 Jeffrey Johnson. All rights reserved.